Welcome to a brand new school year! Fifth grade is an exciting time as your child embarks upon new adventures in the world of learning. This is a year of important transitions. Your child will be encouraged to work more independently as he/she develops a greater sense of responsibility in many areas. It is extremely important that your child bring the agenda to school every day. It will be used daily as an organizational tool, to record weekly spelling words and as a form of communication between home and school. Please help your child by signing it on a nightly basis. The homework load will vary throughout the year. 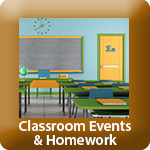 There will be a variety of projects, math work, weekly spelling words, and LA presentations to prepare. If your child has unfinished work from class, it may be sent home to complete. Please check the plone site to check for due dates, homework completion dates, etc. Please feel free to contact me at any time. The best way to reach me is by email or by writing a note in your child’s agenda. I am looking forward to working with you and your child in Grade Five and will be teaching your child the folowing subjects this year: Grade 5 LA, Grade 5 Math, Grade 5 Science, Grade 5 Social, Grade 5 Health, Grade 5 ELA, Grade 6 ELA.